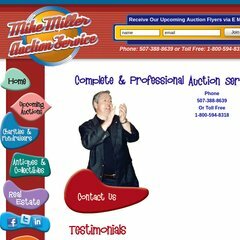 Topics: Upcoming Auctions, Charities & Fundraisers, Antiques & Collectibles, and Real Estate. It has 2 DNS records, ns01.domaincontrol.com, and ns02.domaincontrol.com. It is hosted by Godaddy.com Inc (Arizona, Scottsdale,) using Apache web server. Its local IP address is 173.201.242.1.